Exporter of a wide range of products which include aluminum casted heaters. Aluminium Casted Heaters can be casted into any shape and size needed, thus fully covering the part to be heated and virtually becoming the part itself. Most cast in heaters are made to customer specifications, but standard sizes are available out of stock. Aluminium casted heaters are contamination and corrosion resistant and can with stand high temperature and pressures in harsh environments with trouble free service. 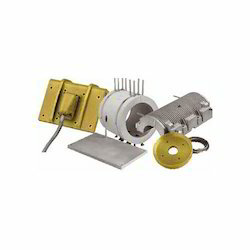 Looking for Aluminium Casted Heaters ?